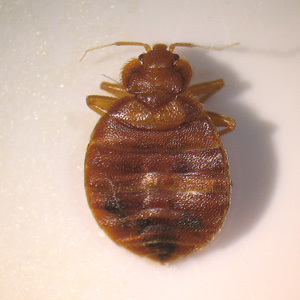 Bed bugs are insects that feed on the blood of sleeping humans and animals. Reddish brown in color, they are as small as 1 millimeter(approximately 1/25th of an inch) and can grow to 7 millimeters(approximately 1/4 of an inch) in length. It's a common myth that dirty areas breed bed bugs. While areas with trash may have bed bugs, bed bugs do not feed on garbage. Bed bugs feed exclusively on blood. These sneaky pests are dormant for most of the day and come out at night to feed. Bed bugs have been known to crawl up to 100 feet in one night. Which is another reason if you suspect you have bed bugs you should make sure to check all areas in or near the infested area. Click here for bed bug extermination methods. When bed bugs bite they inject the area of the bite with an anesthetic(numbs the area bitten) and a anticoagulant(makes the blood at the bite area thinner and stops it from clogging up). That coupled with the fact that most people are asleep when the bite occurs, is why we hardly ever feel the bite as it happens.